The journal Employees & Employers: Labour Law and Social Security Review (Delavci in delodajalci) was founded in 2001 with the intention to develop and promote scientific research and knowledge in the fields of labour and social law and to promote the dialogue between the academic and research community and the experts in practice as well as the social partners. The journal publishes scientific and professional articles, discussions, comparative analyses, analyses of legislative, administrative and judicial developments in Slovenia and in the EU, case law of the Slovenian labour and social courts and of the CJEU, ECHR, ECSR etc., book reviews, reports from conferences and other relevant events in the fields of labour law, industrial relations, employment policy, social security. The journal also presents the research findings of practical relevance to the practice. Every year, a double issue (No. 2-3) is dedicated to publishing of papers delivered at the Slovenian Annual Congress of Labour Law and Social Security. The journal has become, together with the Congress, the central forum for meeting the leading academics and professionals, social partners and practitioners in the field of labour and social law in Slovenia and for confronting different opinions for further development of legislation as well as the case-law and everyday practice in this field. 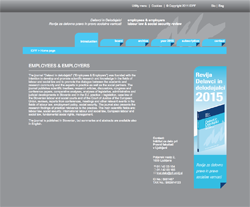 For further information about the journal Employees & Employers (Delavci in delodajalci) please visit the journal web page. A publication of the Institute for Labour Law at the Faculty of Law, University of Ljubljana. Language: Slovenian and English, with short abstracts and extended summaries in English. Current/past issue of the journal Employees & Employers can be located here. A subscription to the journal Employees & Employers is 93,30 EUR (annual subscription for 4 issues per year; each issue 28 EUR). Order online or contact Institute for Labour Law at the Faculty of Law, University of Ljubljana, Poljanski nasip 2, SI-1000 Ljubljana, Slovenia; Tel: +386 (1) 4203 164; Fax: +386 (0)1 4203 165; E-mail: inst.delo@pf.uni-lj.si. Subscription information and a subscription form can be found here. The journal Employees & Employers: Labour Law and Social Security Review (Delavci in delodajalci) is predominantly focused on labour law – individual and collective labour law and social security law, i.e. legal analyses, however, it also publishes articles dealing with industrial relations, employment policy and other related topics and it promotes the interdisciplinary approach. The journal welcomes the submission of scientific articles as well as other contributions, such as case-law reports, comments, book reviews, research findings etc. Target audience of the journal are academics, social partners, policy makers, administration, courts/judges, practitioners and law students. Articles in the journal are peer reviewed (double blind system). The journal Employees & Employers publishes articles in Slovenian language, with a short abstract and an extended summary in English. However, foreign authors are welcomed to submit articles in English. An article submitted to the journal Employees & Employers has to be an original unpublished work and should not be simultaneously under consideration for publication elsewhere. Authors are invited to send submissions to the journal Employees & Employers via e-mail at inst.delo@pf.uni-lj.si. For further information please contact the publisher (inst.delo@pf.uni-lj.si) or Prof Barbara Kresal, Editor-In-Chief (barbara.kresal@pf.uni-lj.si).